I had the pleasure this year to enjoy the NBC-TV broadcasts of the Olympic Winter Games in Sochi, Russia, as I’m hoping many of you also did. It was thrilling to see Ted Ligety win gold in the Men’s Giant Slalom, breathtaking to see Kaitlyn Farrington win gold in the Ladies’ Snowboard Halfpipe, and moving to watch Meryl Davis and Charlie White reach the top of the podium in Couples’ Ice Dancing. My heart sank to witness Shaun White fail to win gold a third consecutive time, as well as Shani Davis competing below expectations. At no point, however, did the athletes fail to impress me with their incredible acrobatics, strength and passion. 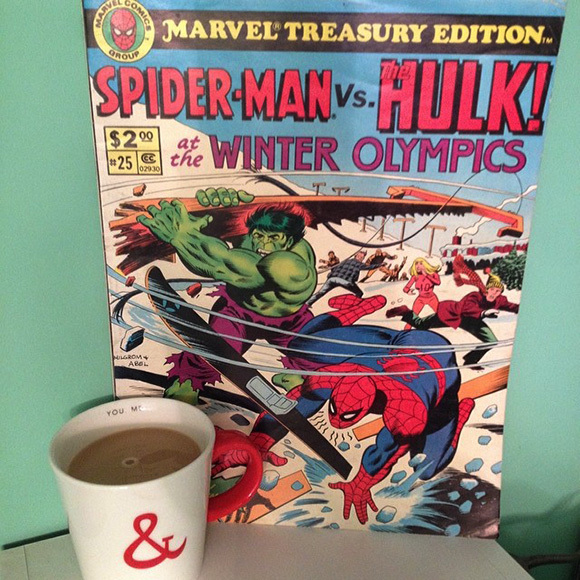 While we may take for granted the super-human feats of Earth’s Mightiest Heroes and Children of the Atom, I have to literally marvel at the extraordinary endeavors of the Olympic competitors, for which I would not hesitate to apply every adjective which has ever escaped Smilin’ Stan’s erudite lips! Still, in the same year our puck-wrangling patriots defeated the indomitable team from the USSR in the “Miracle on Ice”, we learned courtesy of the scintillating storytellers Bill Mantlo and Herb Trimpe how the 1980 games nearly met with disaster in “Spider-Man vs. The Hulk at the Winter Olympics”! The Bronze Age of Comics offers some of the most clever and hilarious tales of super-powered shenanigans in all of comics history. Some real gems can be found in the pages of Prez: First Teen President, Beware the Claws of the Cat, Ironjaw and DC 1st Issue Special: Lady Cop. Marvel Treasury Edition #25 takes its place among the best of these books as it pits two of the House of Ideas’ most popular heroes against one another in the most absurd of settings, and somehow they are not the most outlandish parts of the story. We begin with a chaotic scene in the Olympic Village at Lake Placid, New York (home of the 1980 Olympic Winter Games) where a quartet of hooded figures are absconding away with one of the Russian figure skaters, only to be interrupted by the Amazing Spider-Man! A battle ensues where Spidey tries his web-slinging best to subdue a massive strongman, a skinny avalanche-hurler, a misshapen man with diamond-hard claws and an aged woman who manipulates water. The artwork of the action is dynamic and exciting, but I don’t think Trimpe had access to much reference material concerning the Winter Olympic Games. On many pages in the book, the renderings of bobsleds, luges and ski-jump ramps look nothing like their real-life counterparts (even for 1980–I checked). Spidey faces each of his opponents’ powers and emerges triumphant, but the Russian skater still ends up abducted, albeit not by the deformed foursome but by a crystal trap which springs from the Earth itself only to sink back down and disappear from view. Peter Parker returns to his photographer duties and we next see the Hulk careening into view during his miles-long leaps which bring him into Lake Placid from parts unknown. While he may be minding his own business, the lava men below decide to use him for target practice and trap him in a crystal prison which we saw before with the skater. Hulk takes umbrage at this outrage, of course, and pummels the lava men back into their cave. As he chases them downward, a beautiful woman sneaks up to him and convinces Hulk to come with her for some food, drink and a little R&R. We learn that she (Kala is her name) actually plans to drug him into helping her defeat her enemies for control of the legendary Fountain of Youth and supremacy of all Subterranea. The next day, a large crowd has gathered to view the games, where the American athlete, Brad, successfully breaks the world ski jump record, only to fall victim mid-air to one of those mysterious crystal traps, bringing him down underneath the earth. He joins the other abductees far below the surface: a French bobsledder, a Canadian hockey player and the aforementioned Russian ice skater. Spidey bursts into action, but finds himself ambushed by the four agents he encountered earlier who knock him unconscious and bring him to their master, the Mole Man! Far underneath where the games are played, the wall-crawler awakes thinking that Mole Man is responsible for the kidnappings, but then learns that it was the ageless Kala, who is seeking to rule Subterranea and gain eternal vigor through the Fountain of Youth (which is in the Mole Man’s possession). Her plan is as yet unclear, but it begins with an all-out assault on the Mole Man’s forces, which is presented in a gorgeous double-page splash scene where the Mole Man’s moloids and his four agents battle against Kala’s lava men. The plot thickens as it also muddles, and we learn the purpose of the athletes’ abduction. Instead of annihilating each other’s forces, Mole Man and Kala agree to a contest of champions, where she has kidnapped Brad’s (the U.S. ski-jumper) girlfriend and used an aging ray to turn her into a senior citizen. If they will fight on Kala’s behalf, then she will return the woman back to her younger self and give them their freedom. And so, the athletes (including the ice skater who speaks only Russian but somehow understood everything that was discussed), agree to the terms and are granted special high-tech tools corresponding to their sport. The ice skater gets skates and bracers with “deadly” blades, the bobsledder gets a rocket-powered sled armed with flame-cannons, the hockey player gets a super-stick that fires “power pucks”, and Brad gets rocket skis with “power poles” – “the most advanced weapons known to subterranean science!”. And thus, the contest is set: each of these athletes tests their mettle against the Mole Man’s agents. The clawed one must stop the bobsledder from reaching the end of the track, the water witch tries to keep the ice skater from reaching/touching her, the avalanche maker has to keep the ski jumper from skiing down to the finish line (because ski jumpers can easily switch to alpine skiing, obviously), and the strong one must hurl a large stone past the hockey player into a flaming net. All of this takes place, of course, as the Hulk is pitted against Spider-Man and Kala’s lava men try their best to sabotage the Mole Man’s contestants. Oh, did I mention that either Mole Man or Kala have thrust the Olympic Village a mile high into the sky on hydraulic lifts so that their contest will not be disturbed? Ultimately, the girl finds her way to the Mole Man’s fountain of youth and makes her way to the surface, therefore negating Kala’s leverage on the athletes. Spidey finds a way to out-maneuver the green goliath and the Olympians thwart Kala’s plans, spoiling her stolen youth which causes her army of lava men to abandon her. The Mole Man is overjoyed by his victory, but offers Kala the option of returning below the surface to be his queen. She gladly accepts, considering that her looks won’t be much of a factor down where no one can see them (because that makes complete sense). Once the Hulk sees that his no-longer-young-and-beautiful queen has left, he notices how they are all high up in the sky, and so he pounds on the ground, which instead of breaking the earth apart actually pushes the hydraulics downward (don’t try and apply any science here). The heroes part ways and things return to normal as the games resume and Brad is reunited with his sweetheart. Some of this book is really amazing, particularly the splash pages. Trimpe has strong skills when it comes to character expressions, distinguishing features and certain scenic features. However, some items look ridiculously awful, particularly the sports equipment and competition areas. There are some awesome features within the action scenes, including Kirby-esque weapons and angles, and George Rousos adding emotion and drama with his strategic use of color. We also get no shortage of crazy visuals, such as Hulk wearing ridiculous gladiatorial armor (not unlike his later Planet Hulk garb), the jade giant eating in Kala’s hideout what looks like a handful of marshmallow fluff, and then Hulk sending the lava men careening in a giant rolling snowball only to later get sent rolling down a hill in a snowball of his own courtesy of your friendly neighborhood Spider-Man. I especially enjoyed the opening splash page which features the Hulk and Spidey facing off while surrounded by images of Olympic athletes, including an elegant portrayal of an ice skating pair and an action shot of the U.S. hockey team taking on a squad with “CCCP” on their uniforms. 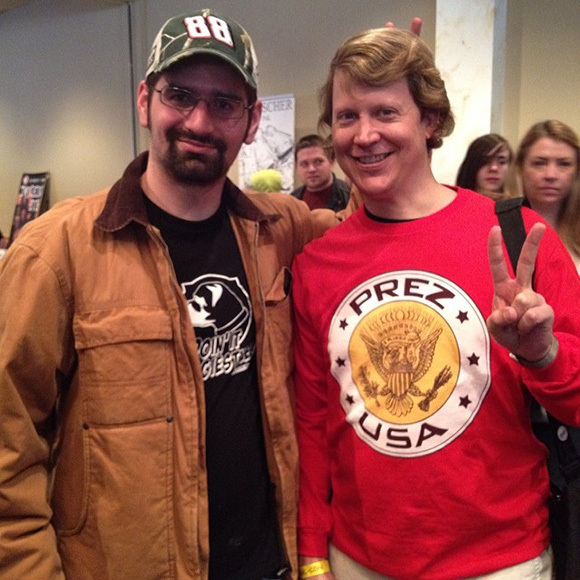 Once the actual Olympic games reached their conclusion this year, I went on to represent my country in a completely non-athletic manner as I cosplayed as Prez at the Northwest Indiana Comic-Con. Not only did I pay homage to one of my favorite Bronze Age characters, but also found this delightful Treasury Edition within the retailers’ area, which I am thrilled to share with you all. The thing about wearing a costume at a convention, true believers, is that not once did I need coffee to stay alert or get my heart rate up, because my nerves and excitement were continuously ramped up. Sadly, there would only bet three more issues of Marvel Treasury Edition following this mega-sized gem, so the inside back-cover ad for “Marvel Super-Heroes at the Summer Olympics” would never see print. It is left to us to dream what might have been, but I’m willing to be that it would probably have been as silly, fabulous and enjoyable as this one. Fare Thee Well! Marvel Treasury Edition #25: Spider-Man vs. 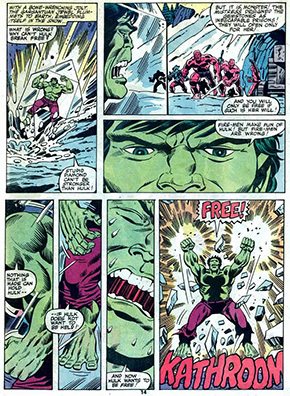 The Hulk at the Winter Olympics is plotted by Bill Mantlo, Mark Gruenwald and Steven Grant, scripted by Bill Mantlo, penciled by Herb Trimpe, inked by Bruce Patterson, lettered by Jim Novak, colored by George Rousos and edited by Mark Gruenwald, with a front cover by Al Milgrom and Jack Abel and back cover by Bill Sienkiewicz and Bruce Patterson (1980).